It was a solemn day as members of the Johannesburg Emergency Management Services gathered at the Ellis Park Arena in Johannesburg to pay their respects to three firefighters who died while battling a fire at the Bank of Lisbon building. The anger among those gathered was palpable, with many speakers vowing to honour their colleagues by taking a stand against government negligence. 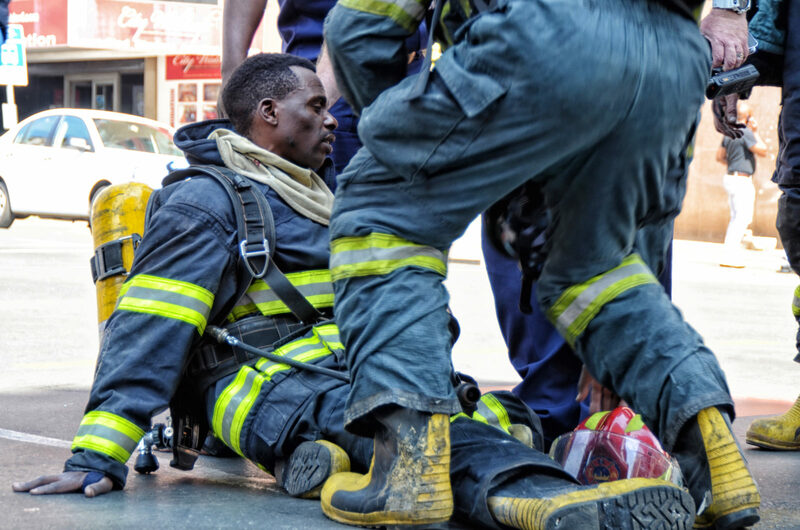 Firefighter Simphiwe Moropane, 28, acting platoon commanders Mduduzi Ndlovu, 40, and Khathutshelo Muedi, 37, died while fighting an inferno in a government building, which was later revealed to be in contravention of building health and safety standards. Simpiwe Sibiya, a firefighter from Fairview fire station in Johannesburg, said Ndlovu and Muedi were dedicated servicemen who died while doing something they loved. They had fought many fires together. “I am here today to send off two of my brothers… my heart is broken,” said Sibiya. Sibiya met Muedi in 2006 when they joined the fire department. Being of the same age, they were soon good friends. For Sibiya, his fallen colleague was a man of his word who was always ready to encourage him. Muzikayise Zwane recounted the conditions he and colleagues from the Central Fire Station in Johannesburg encountered. “We received the call at 10.13 on Wednesday morning and I sent my guys there,” said Zwane. A short while later he received another call from the building where his men told him how bad things were. Describing the horrendous challenges his men encountered, Zwane said the firefighters had set up a site on the 22nd floor, below the floor where the fire was raging. However, they could not find any water in the building. And when the fire broke through to the floor they were on, they became trapped. “They told me ‘we cannot see our way’ and asked that I send a rescue team,” said Zwane. He rushed to the building, but as he arrived, one of his colleagues fell from the 22nd floor. “The government killed our brothers, because this was a government building,” said Zwane. Zwelinzima Vavi, General Secretary of the South African Federation of Trade Unions, said the plan was to sue government. “We have taken the decision to sue. We are going after you, comrades. These are not chickens that died. These are human beings, sons, breadwinners. They will not die in vain,” Vavi warned during his address at a memorial service. Vavi was referring to Gauteng Premier David Makhura and MEC for Infrastructure and Development Jacob Mamabolo. Neither attended the service. His comments came after Mamabolo said last week that a report showed the building was only 21% compliant with health and safety requirements. “In that building, not one fire extinguisher was working. All the water pipes had dried up. There was no water in that building. Lives should never have been lost due to negligence and incompetence,” Vavi said. The Democratic Municipal and Allied Workers Union of South Africa (Demawusa) demanded a judicial inquiry into the tragedy. “If this inquiry uncovers criminal activity, so be it and the law must be [brought to bear] on those who have robbed three families of their breadwinners,” the union’s Stephen Faulkner told mourners. The union further called for an assurance that the firefighters’ families would be taken care of. “Families must be reassured in 24 hours that their material needs be taken care off. Help those families now. These are minimum demands,” Faulkner said. The unions are demanding that an incident such as the Bank of Lisbon fire should never happen again. “We are in a crisis. Enough is enough. Let this be the last time a firefighter falls to his death,” Demawusa’s Terrence Kgaffe said. Mashaba expressed his deepest condolences to the families of the firefighters. “I cannot even imagine the pain and grief you are experiencing. I hope you can find peace in the profound gratitude of the people of Johannesburg,” he said. The city is to assess the Bank of Lisbon building and establish whether it has the potential to function. “Let’s look closely and see if it should be salvaged or destroyed,” Mashaba told mourners and emergency management services officials. Mashaba also committed to fighting the scourge of derelict buildings in the city through the formation of a specialised task team.